You’ve got a functioning list of stock ticker symbols now; however, it’s just a list of symbols and nothing more. Let’s explore how to add a static stock quote to each of the ticker symbols. While you used the ArrayAdapter in the previous part, you can’t use that adapter here since it only accepts a layout that contains a single TextView. One of the easiest and most flexible ways to use the layout that was just created is to create your own adapter by making a new class that extends from ArrayAdapter. To do this, you can start by making a data class that will hold the stock quote information. This class will be used as the type parameter to ArrayAdapter when you create your new adapter class. 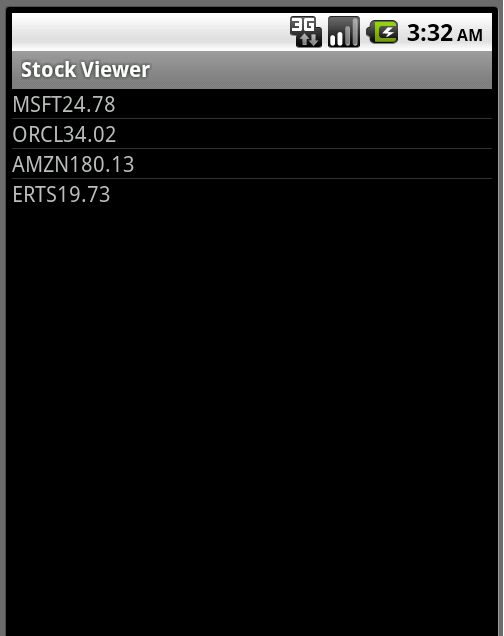 I’ve provided a basic class below that holds the stock ticker and quote, along with getters and setters. Now that you have a class to hold the stock quote data, you can create the custom adapter that will use that class. The key behind extending ArrayAdapter is to override the ArrayAdapter.getView(…) method. If this isn’t done, you will run into the limitation of the ArrayAdapter class that requires you to provide it with a layout that only contains a single TextView (i.e. java.lang.IllegalStateException: ArrayAdapter requires the resource ID to be a TextView). I’ve put together an adapter class that will fulfill the requirements for this part of the series. Well, that looks… quite ugly. You’ll also notice that we’ve lost the font formatting when using the simple_list_item_1 layout. This is because the simple_list_item_1 had some simple formatting applied to the single TextView in the layout. In the next part I’ll go over layout and formatting in some more detail. This will assist in readability and help clean up the view. This entry was posted on Saturday, April 2nd, 2011 at 10:18 pm	and is filed under Android. You can follow any responses to this entry through the RSS 2.0 feed. You can leave a response, or trackback from your own site. Quite neat post. I simply stumbled upon your weblog and desired to say which I possess actually preferred reading your blog posts. Anyhow I’ll be subscribing to your blog and I hope you post again quickly! Thanks for such a neat code! Helped me a lot! Very good, this helped me a lot! I didn’t have a clue how displaying lists worked before reading this. Thanks for this wonderful series.But i got 2 error while using the above code. 1. List stocks should be changed to List stocks. 2.In StockQuote class , you have declared quote as Double and yet you are assigning it a string. I think this should also be changed.